The movie Frozen is all kids can sing these days, and we can't blame them! With catchy tunes and loveable characters, the Pixar film has kids and adults alike hooked. Somehow with the anticipation of summer beginning, we're still hoping for a little icy magic. 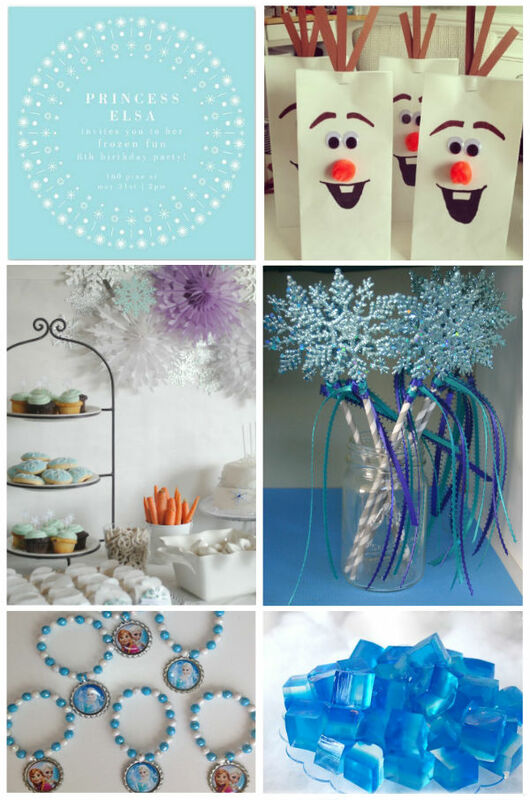 Welcome the sight of snowflakes back to your home with a frozen themed birthday party. Guests will be surprised and delighted to see this snowflake invitation appear in their mail this time of year. Playful wording of "Princess (insert birthday girl's name) invites your to her frozen summer party" will get guests even more excited. During the party, cool off with a party theme of blues, purples, and silvers to accent the ice occasion. We love the idea of leaving food on a designated table for kids, so that they may help themselves to treats like Olaf noses (carrots), melted snowmen (water), or reindeer antlers (pretzels) when they need a quick snack. Arts and crafts ideas are endless for kids. We particularly love these friendship bracelets or these princess snowflake wands. End the day with yummy frozen desserts, like these "ice blocks" made of blue jello. Just because it's warm outside, doesn't mean we can't build a snowman!